It's been about 10 years since I've posted a picture to HHPlace. I've read and rarely made a comment, but for some reason I decided to shoot some photos. I found my old thread. But it's so old, it's been closed to comments. I don't any of those shoes anymore. I tend to change them out as fashion and my tastes progress. I bought some Jessica Simpson pumps at Nordstrom recently and wore them a number of places, including breakfast and lunch a couple fast casual restaurants and shopping at the mall between. Went into Dillards department store and checked out the shoe department. No comments from anybody this time and hardly any notice at all. I think that if your clothes are fashionably appropriate, you don't really look unnatural, despite the incongruity. I think that may account for the lack of notice and comments. As I was exciting the restaurant, I glanced at my reflection in the window as I strode to my car, much like the pose here. Looks good. Wish I had the confidence to do that! Fantastic. Good to see you back!! Very nice and tasteful outfit. I recently wore this exact outfit to the eye doctor, a diminutive but stylish woman, who couldn't be over 5 feet in height. She said, "Oh you shouldn't wear heels around me. I tell my 5'10" husband to always wear flats!" The comment made me wonder what her husband's non-flats were exactly. 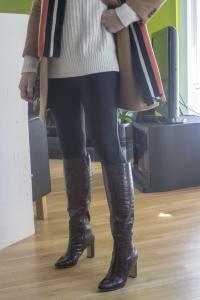 These are inexpensive boots from Forever 21., but fun for a lark. Tailored pants is the way to go because they keep your legs slender, which is harmonious with a slender high heeled shoe ! I love your pumps too - an open instep (half d'orsay) is a lovely variation.